To Cite: Dehghani M, Sadatjo H, Maleknia H, Shamsedini N. A Survey on the Removal Efficiency of Fat, Oil and Grease in Shiraz Municipal Wastewater Treatment Plant, Jentashapir J Health Res. 2014 ; 5(6):e26651. doi: 10.17795/jjhr-26651. Background: Fat, oil and grease (FOG) in municipal wastewater treatment plant (MWWTP) caused many problems. Objectives: This study aimed to determine the removal efficiency of FOG in Shiraz MWWTP. Materials and Methods: The removal efficiencies of FOG in the MWWTP were studied from June 2011 to September 2011 in Shiraz (Iran). The influent and effluent wastewater samples were collected in a volume of one liter (4 samples per week) and analyzed according to the standard methods. Samples are transferred to the laboratory immediately. The concentration of FOG was determined using the solvent extraction and separating funnel and then compared with the effluent standards. To analyze the data, SPSS (version 11.5), Chi-square test and t test were used. Results: The results showed that the FOG amount in input raw sewage in the MWWTP from June 2011 to September 2011 was around 25.5 mg/L and the amount in treated wastewater was about 8.1 mg/L. The FOG removal efficiency in this refinery was about 70% and met the environmental standards for the discharge (less than 10 mg/L) (P < 0.05). Conclusions: The effluent can be discharged to surface waters or used for irrigation. In order to the FOG concentration met the effluent standards, it is very crucial to control the entrance of industrial wastewater to the municipal wastewater collection networks. Otherwise, the MWWTP should be upgraded and the special techniques used to reduce FOG. Fat, oil and grease (FOG) are insoluble in water and basically made of esters of glycerol, fatty acids or triglycerides (1, 2). One of the most significant characteristics of natural oils is low solubility in water with high tendency in dissolving in organic solvents. Furthermore, the specific gravity of these compounds is less than that of water, and they easily become saponified in alkaline media. Depending on the rate of solubility, these compounds can be in solution form or emulsion. FOG is defined as a compound either in liquid or solid state, basically from animal or vegetable sources. Oil is often defined as triglycerides that are liquid at room temperature (3). Grease is a general classification for fats, oils, waxes and soaps that have a negative effect on the wastewater treatment system. Fat, oil and grease can enter into the municipal wastewater treatment plant by discharging swage from residential area, cafeterias in schools, restaurants, prisons, hospitals and industries that generate FOG include meat processors and food packagers. Large amounts of oil and grease in the wastewater cause trouble in the collection system pipes. It decreases pipe capacity and, therefore, requires that piping systems be cleaned more often and/or some piping to be replaced. Oil and grease also hamper effective treatment at the wastewater treatment plant. The other problems relating to the presence of FOG are decreasing the efficiency of wastewater treatment plant by aerobic and anaerobic processes and decreasing the quality of wastewater effluent and therefore threatening the aquatics life and polluting groundwater and surface water resources as well. The existence of fat and oil in water, even in low amounts, may make it unsuitable for drinking (4). The amounts of FOG in the strong, medium and weak municipal wastewater are 100, 90, and 40 mg/L, respectively. Additionally, the standard amount of fat and oil in industrial wastewater discharged into public municipal sewers is at most 50 mg/L. The acceptable limit of FOG in the effluent is 10 mg/L for reusing it for agricultural purposes or injecting it into ground water resources (5). FOG is a major constituent of organic materials in municipal wastewater. Twenty-five to 35 percent of total chemical oxygen demand (COD) of the raw wastewater is in the form of FOG. The entrance of these compounds into the biological reactor can cause many operational difficulties and increase the concentration of organic material in the effluent (3, 6). The fat present in wastewater is mainly in the form of triglyceride and long-chain fatty acids. Under an anaerobic condition, triglyceride hydrolyses to long-chain fatty acids using lipase (6). By measuring fat and oil concentrations in raw and treated sludge, the degraded fat and oil concentrations during anaerobic digestion can be determined (5-8). Insoluble fats, oils and grease are removed through gravity separation; however, soluble compounds are removed via biological process (9). The removal of fat and oil basically depends on physical and chemical characteristics of these compounds, environmental conditions and the performance of the wastewater treatment plant (3, 10). Pretreatment processes, including addition of chemical materials and dissolved air flotation (DAF) significantly reduce the concentration of fat and oil prior to biological treatment (11-13). By using alum and ferric chloride coagulants, more than 90 percent of the fat and oil can be removed. The efficiency of fat and oil removal by acidification, alum and DAF is up to 85 to 95 percent. Approximately, 80 percent of the fat and oil can be removed using sulfuric acid or hydrochloric acid at pH 3 with a retention time of 1 day (14). Efficiencies of more than 97 percent can be achieved for fat and oil removal using ferric chloride with a cationic polymer (15). Adsorption methods using different absorbents, such as clay minerals are effective in the removal of fat and oil (16). Using ionizing rays like gamma is also efficient in decreasing oil, lubricants, and grease (17). Furthermore, 80 to 90 percent of fat and oil can be removed with the help of microorganisms during biological treatment. Oil compounds are absorbed in wastewater through flocculation and then are metabolized slowly (18). Lipase is also an important enzyme for the removal of fat and oil (11, 19). Glycerol is mainly changed into acetate by acidogenic bacteria, though long-chain fatty acid is changed into acetate, hydrogen, and CO2 by beta-oxidation metabolism (6). The fat and oil removal efficiency up to 70 to 95 percent can be achieved by combining a physical method with the biological active sludge process (6). Studies showed that FOG removal efficiency by membrane methods was more than the conventional active sludge. The membrane methods removed more than 90 percent of these compounds (20). A combination of membranes with the biological methods can efficiently remove FOG. In addition, the combination of aerobic and anaerobic processes can be effective (21). An up flow anaerobic sludge blanket process (UASB) is able to remove more than 70 percent of the FOG (13, 16). Moreover, development of the DAF before UASB increases the removal efficiency (22). The UASB combined with activated sludge is able to decrease 98.9 percent of the FOG (23). In activated sludge processes with the proper ratio of nutrients to mixed liquor suspended solids (MLSS), the reduction of 93.3 percent can be achieved (24). Since there is a concern regarding the effect of FOG on people's health and the environment, this study aimed to (i) measure the concentration of FOG in the influent raw wastewater and effluent and (ii) evaluate the feasibility of Shiraz MWWTP using activated sludge for the removal efficiency of FOG. This data can be used to upgrade wastewater treatment plant for improving the removal efficiency. The characteristic of Shiraz MWWTP using activated sludge process were as follows. The influent and effluent phosphorous concentrations were 6-8 and 1.25-1.75 ppm (PO4-3), respectively. In addition, the influent and effluent ammonia nitrogen concentrations were 30-35 and 0.8-0.9 ppm (PO4-3), respectively. Mixed liquor volatile suspended solids (MLVSS) and Mixed liquor suspended solids (MLSS) were 2350-2376 and 5488-6598 mg/L, respectively. Shiraz MWWTP is located in the southeastern region of the city. The first module was operated for the population of 409000. The second module was designed for the total population of 548000, which will be used for the near future. The wastewater treatment plant is using the primary and secondary treatment. The activated sludge process is used mainly for the purpose of organic carbon removal and not used for the nitrification or denitrification process steps. It consists of the following units (Figure 1): 1) screening, 2) grit removal chamber with skimmer, 3) primary sedimentation tank, 4) aeration tank, 5) secondary sedimentation tank and 6) chlorination unit (Figure 2). It is a cross-sectional study to determine FOG removal efficiency at the Shiraz municipal wastewater treatment plant in 2011. In this study, the grab sampling was used to take a sample from the wastewater treatment plants during a 2-month summer period. Each week, four 1-L samples were collected from the raw wastewater influent and effluent. A total of twenty-three samples were collected and placed into glass containers under standard conditions (25). Each sample only shows the characteristics of the wastewater at the time of sampling. All the sampling was performed in two replications. The samples were transported to the laboratory within the maximum period of 3 hour to analyze FOG. Samples of fat, oil and grease were extracted with n-hexane and measured using the weighted method (25). Then, the results were compared with the standard (26). 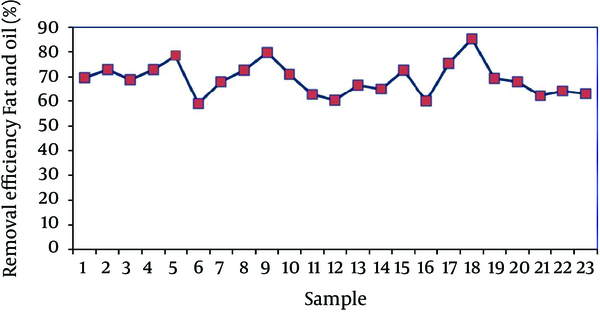 Data were analyzed using SPSS 11.5, Chi-square test and t-test. The level of significance was equal to 95 percent level of confidence and α = 0.05. The minimum, maximum, and average amount of FOG in influent wastewater and the effluent at Shiraz MWWTP and also the removal efficiency are summarized in Table 1. The results indicated that the minimum, maximum and average amount of FOG in the influent raw wastewater were 7.50, 47, and 25.50 mg/L, respectively. Additionally, the minimum, maximum, and average amounts of FOG in the effluent wastewater are 2.30, 18, and 8.1 mg/L, respectively. Figures 2 and 3 show the concentration of FOG in the influent raw wastewater and the effluent wastewater at Shiraz MWWTP during the two-month study period in summer 2011. Figure 4 shows the removal efficiency of FOG at the plant during the 2-month study period in summer 2011. The range of FOG removal efficiency at the wastewater treatment plant is 59 to 85 percent with the average of 70 percent. The obtained results show that the average concentrations of fat and oil in the influent raw wastewater and effluent at Shiraz MWWTP in summer 2011 were about 25.5 mg/L and 8.1 mg/L, respectively. The average removal efficiency was about 70%; however, research indicated that under optimal conditions of the nutrients and MLSS, 93% FOG removal efficiency can be achieved in the activated sludge process (24). The efficiency of oil removal from Iran Khodro wastewater is 48% using DAF, the removal efficiency of more than 90% can be obtained using the coagulants with DAF (10). According to the current study, it can be concluded that the efficiency of fat and oil removal in 70% of the obtained samples was relatively appropriate. The amount of fat and oil in the effluent is less than the standard limit for discharging into groundwater resources (10 mg/L) (P < 0.05). However, 30% of the samples showed that the amount of fat and oil is above the standard limit. The main reason can be due to the inability of the activated sludge system to remove fat and oil during fluctuations in the wastewater composition and flow rate as well (24). The removal efficiency depends on the influent concentration of fat and oil. Therefore, at higher concentration of fat and oil, the removal efficiency is significantly decreased. This decrease in efficiency may occur because fat and oil negatively affect the efficiency of aeration units, which significantly reduces dissolved oxygen in the units. To maintain a standard rate of fat and oil in all the effluent samples, industrial wastewater entering the municipal wastewater collection network must be precisely monitored; otherwise, the MWWTP should be upgraded and the special treatment methods need to be employed to remove fat and oil. The authors would like to thank the Deputy of Research and Technology of Shiraz University of Medical Sciences for its financial support for the research project of 92-6481. Also, we would like to thank the Fars Water and Wastewater Company for providing facilities and excellent technical assistance. 9. The Effect of pH on the stability of grease and oil in wastewater from biodiesel production process. The 10th annual conference of Thai Society of Agricultural Engineering “International conference on innovations in agricultural, food and renewable energy productions for mankind.